"Post truth" may be the buzzword for 2017, but "fake news" has a long history. 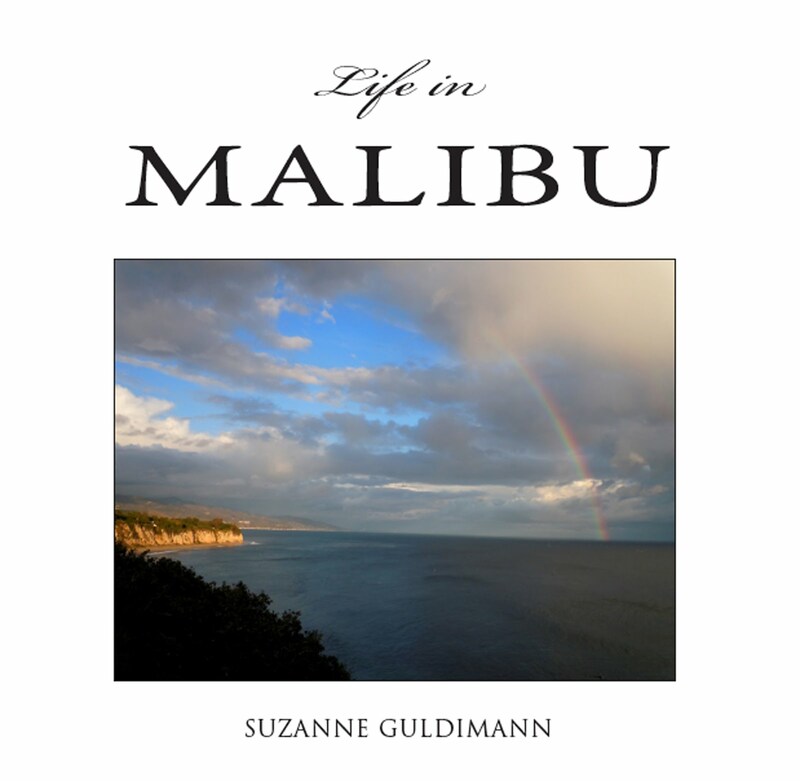 And Malibu, a forbidden paradise in the early years of the 20th century, was a prime source for tall tales and improbable stories. 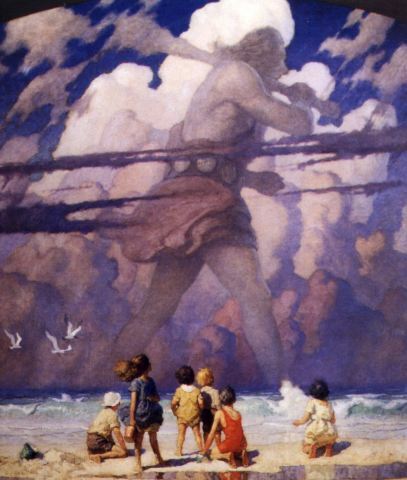 Mermaids, lost civilizations, giants, wild men, and pirate treasure? 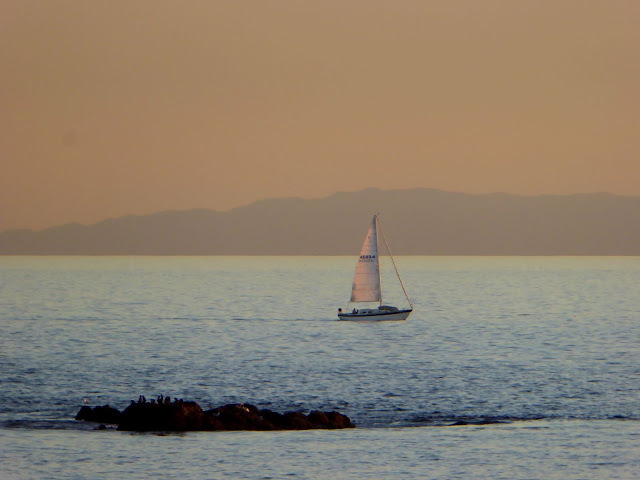 Avast ye matey, we've have them all in Malibu, or at least rumors of them. Cue the march from Raiders of the Lost Ark, grab your hat, treasure map, and compass, and don't forget to pack some string—useful for tying up loose ends and suspending disbelief. A 1908 Los Angeles Times article described Malibu as a "narrow stretch of tempting caves and coves, once the rendezvous of pirates, smugglers, outlaws and bandits, has proven a boon to treasure hunters after yarns of the Baron Munchausen type." Yarns may have been all that anyone brought back, but the article presents a splendid assortment of them. One can imagine that nameless Times editor, now long dead, gathering up a year's worth of oddities during a slow news week in October of 1908 and putting them all together to make a catalogue of marvels—a sort of journalistic stone soup intended to fill an empty column. He couldn't know that a hundred years later that article would be brightening a rainy day. I'm so glad they let us know it was "Exciting." Apparently they'd run out of exclamation points. The unnamed editor who assembled this masterpiece certainly made a heroic effort to tie all the threads of the article together. I especially like "Where Giants Died, Pirates Also Dallied." The first marvel to catch the eye in the Times' feature was a "burning mountain" discovered near the mouth of a Malibu canyon that "keep itself in the public eye throughout a run of nine days...smelling of sulphur," the article states. Intrepid investigators reported "bearing away as souvenirs rocks that were so hot they could not be carried in the hand." There was also a report of a mermaid, or as the Times oh so wittily described her, "mer-miss." 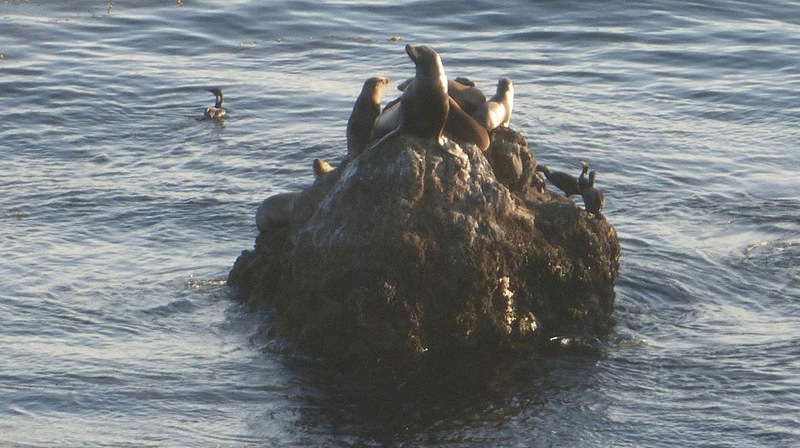 The story is less interesting for its mythical miss, allegedly spotted by the captain of the abalone launch Spindrift, than it is for its description of her roost, a "floating island" visible only at low tide some miles of off Point Dume. Sasquatch's So Cal cousin makes an appearance in 1908 as well. The creature described by railroad worker Bertrand Basey as "a wild man" that "went on all fours," although when frightened from the camp store tent "at the blush of dawn," it stood upon its hind legs, "gave a mournful wail, and was lost in the underbrush." Mr Basey told The Times he could have shot the creature, but "the face, covered with long, shaggy hair, was so like that of a man, that he lowered the weapon." The report concludes that "tracks discovered on the beach that morning thought to have been made by the wild man, were not unlike those of a human being, with the addition of sharp claws." It seems reasonable that the wild man may have been one the Santa Monica Mountain's last bears. Grizzlies and brown bears both lived in the range. In his book Happy Days in Southern California, Frederick Hastings Rindge, the owner of the Malibu Rancho in the late 19th century, recounted hearing the story of homesteader Andrew Sublett, "who had his arm broken by a grizzly bear in Malibu Canyon in 1854. The California grizzly was hunted to extinction in the 1920s and was probably already locally extinct in 1908, but there were stories of brown bear sightings in the Malibu area as late as the 1920s. 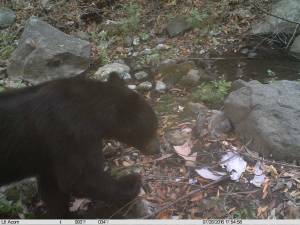 For the first time in decades, the Malibu area is once again home to a brown bear. National Park Service remote cameras have captured images of it and there are anecdotal sightings in the Malibou Lake area, but if wild men still haunt the hills they have a knack for avoiding observation, although there have been reported sightings of Bigfoot's California cousins in the San Gabriel Mountains as recently as 2002, according to the Bigfoot Field Researchers Organization. 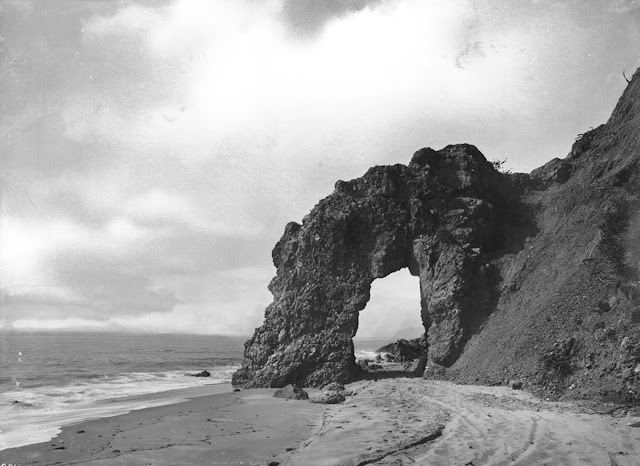 Giants were—pardon the dismal pun—big stuff in the early 20th century, and the same railroad grading crew that encountered the "wild man" shared descriptions of "bones and skulls of immense size" unearthed by a railroad grading crew near Point Mugu. The alleged find echoes a story that made national headlines earlier that year that claimed that three Santa Monica men, camping on the beach in or near Malibu, found 14 giant skeletons. Strange news from the July 8, 1908, San Francisco Call. 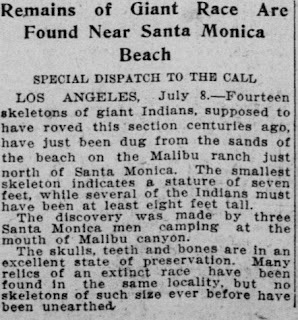 The July 8 edition of the San Francisco Call states that "the smallest skeleton indicates a stature of seven feet, while several of the Indians must have been at least eight feet tall," and concludes that "many relics of an extinct race have been found in the area, but no skeletons of such size have ever been unearthed." By the time the story reached the Washington Times on July 13, the skeletons had grown to nine feet, at which point the story faded from the news. Reports of people finding giant bones continued to circulate through the 1920s, but the only giant visible in Malibu today is the old fiberglass Muffler man who was brought to Malibu to advertise a burger joint and repurposed into a somberro-wearing hombre for the long gone La Salsa restaurant that replaced the burger joint, and his days may also be numbered. 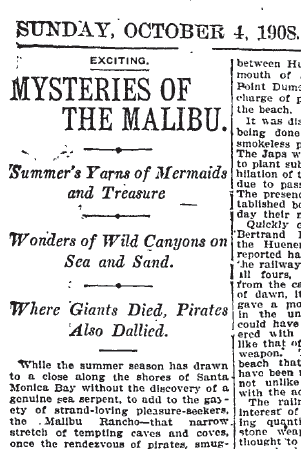 Here at the Malibu Post our favorite story from that 1908 collection of curiosities is the tale of William Drake, who was reportedly prospecting for oil in Sequit Canyon when he struck canvas fabric at a depth of six feet, and not just any old strip of long buried sailcloth, but an enigmatic message left by pirates. Beneath a crudely scrawled skull and bones were printed the words. "Death to all traitors." Here's the illustration of the pirate message that accompanied the L.A. Times article. "Crudely scrawled," indeed. The article reports that Mr Drake, confident that he had uncovered a hidden cache of pirate treasure, continued to dig. Eventually he and his unnamed companions struck water, bailing heroically as they dug, they uncovered "what had every appearance of an immense iron chest, "before the flow of water increased, "gushing into the prospect hole, burying the tools and giving the diggers scant time in which to escape with their lives." Drake allegedly recounted this tale on a trip to Santa Monica to "secure a pump." 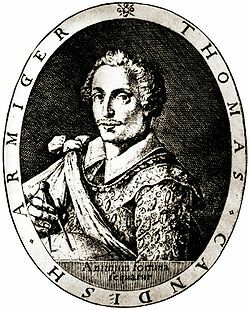 He stated that he saw enough of the chest, rusted and muddy though it was, to conclude that, "it is one of the chests filled with gold that was buried by Thomas Cavendish and his crew of English pirates, who were accustomed in the dim and misty past to waylay the treasure galleons of the Spanish on their way from the Spice Islands with valuable cargoes of silk and gold." Cavendish, an English explorer who was an admirer of Francis Drake, arrived in the Gulf of California in October of 1587 with two ships, the Content and the Desire. On November 4th they spotted the Santa Ana, a Spanish galleon loaded with treasure, and chased her. A battle ensued. The Santa Ana, outgunned by the English cannon fire, surrendered. The captured galleon was much larger than the English ships. Cavendish loaded both ships with as much treasure as they could hold and sailed away, leaving the Santa Ana to sink. The Desire eventually made it back to England. The Content was never seen again. Drake was pinning his hopes on the chest containing the treasure of the Content, rumored for years to have been buried by marooned mariners in the Santa Monica Mountains, after the ship was wrecked in a great storm. That's the story Mr Drake reported before collecting his pump and vanishing off into obscurity. If he uncovered anything other than mud in his excavation history hasn't recorded it, but the Santa Ana's gold isn't the only treasure rumored to be hidden in Malibu's mountains. The December 27, 1907 Cincinnati Enquirer gives a fanciful account of a labyrinth of caves "in a cove to the north of Point Dume, in the direction of the Ventura County line," where "landmarks have recently been unearthed which are thought to have been placed by the survivors of [a pirate] expedition as marking the location of treasure boxes." The caves described in the article came complete with "peculiar hieroglyphics" and mysterious artifacts. The article describes "peculiar rocks of a kind not native to the Malibu country" that "all seem to have been placed in a position which directs to one centering point," and concludes with bright optimism that "Efforts are now being made to translate the readings of the stones, and with this object in view excavations are to be made for some underground workings or for the cipher tablet that will give the key to the exact location of the treasure." And in case you, dear reader, are seized with the mad desire to become a real life Goonie and seek this mythical cave and its missing treasure yourself, the author of the article helpfully informs us that "The doubloons and rich plate are believed to be within a league of Point Dume, the frowning point of rocks that is observed in the form of a sea lion jutting into the sea about 25 miles westerly from Santa Monica." You can read the entire 1907 article at the home of Haunted Ohio Books. 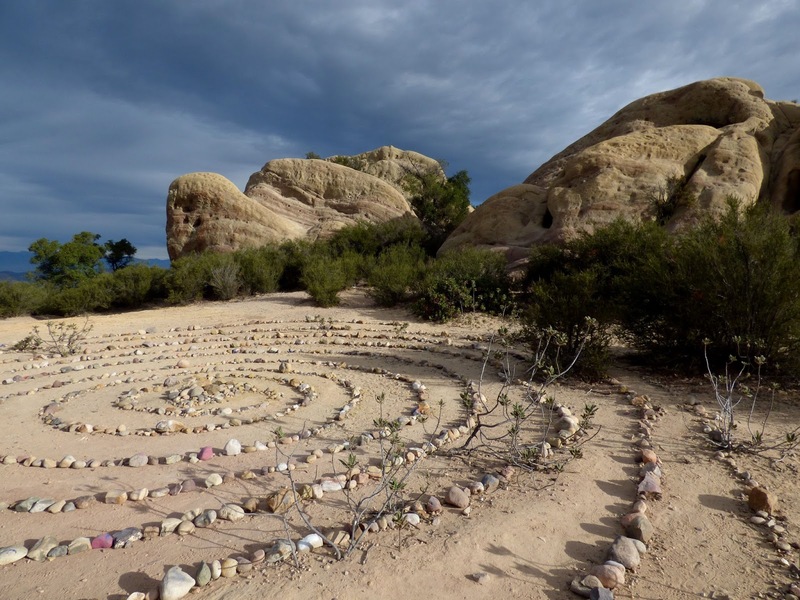 State Parks has warred with resident supernatural beings over this ring of stones in Corral Canyon for years. Parks removes it; spirits replace it, but it's only a couple of decades old. These stones are probably intended as an invitation to meditation and contemplation, not as a guide to pirate treasure. Not all the buried treasure in Malibu's storied history is a myth. 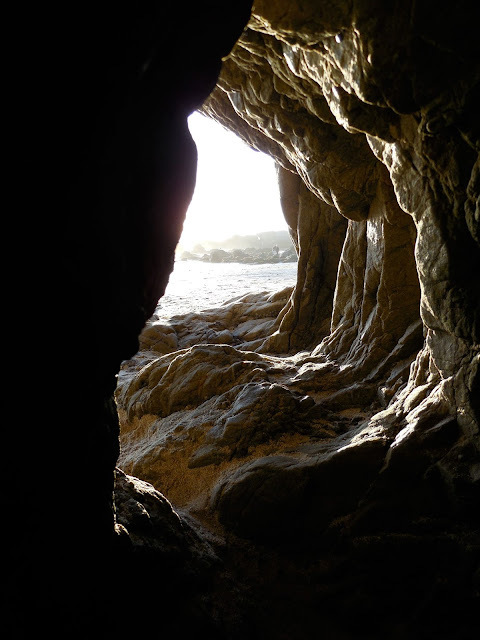 Tiburcio Vásquez, busy bandit that he was, is said to have buried gold and other contraband in Las Flores Canyon as well as in the Aqua Dulce rock formations that still bear his name, and it's distinctly possible that his loot still rests in some backcountry Malibu cave. 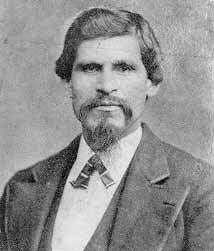 Legendary local Robin Hood Tiburcio Vásquez is said to have hidden some of his vast quantities of ill-gotten gold in Malibu. There's a good chance the the story might even be true. Malibu still generates unusual headlines. There was the whole underwater UFO base brouhaha several years ago, and there's a gentleman who has often been interviewed about his theory that the Santa Monica Mountains hold the ruins of the legendary land of Lemuria, but the Santa Monica Mountains are a lot smaller than they were at the start of the last century, and sightings of sasquatch have given way to sightings of celebrities. Balanced Rock, really does resemble an Easter Island Moa. The rock is not really balancing. Instead, it's an old volcanic core, firmly attached (for now at least) to the mountainside. 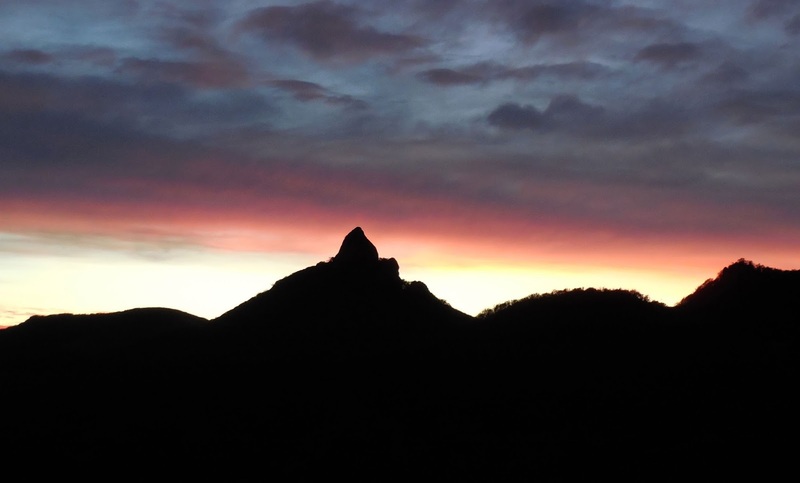 The whole Sandstone Peak/Boney Ridge area, including this intriguing landmark, is not sandstone. 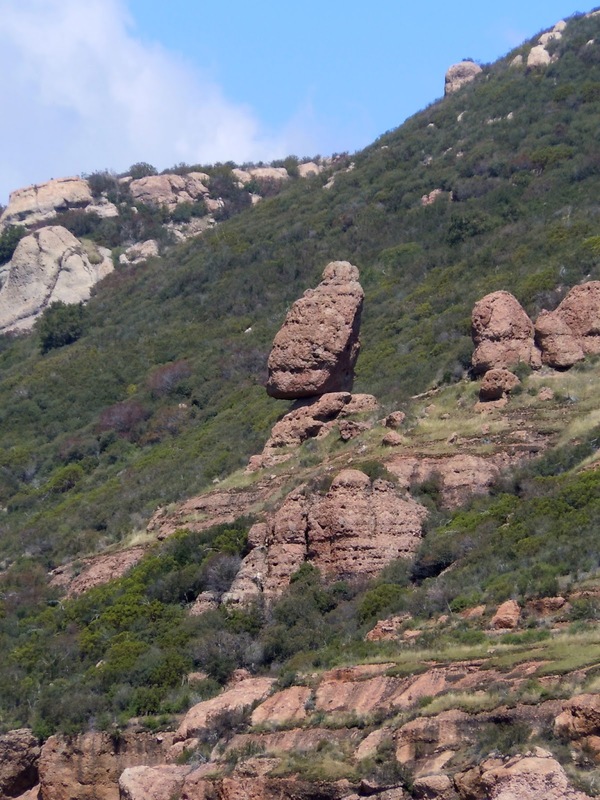 Instead, it's part of the Conejo Volcanics Formation discussed above. The volcanic rock erodes at a slower rate than the sedimentary rock around it, leaving enigmatic formations all over the mountain range. Alas, geologists assure us that the fanciful shapes are the work of geologic processes and not evidence of lost civilizations. The mermaids, wild men, giants, and lost civilizations that once made the front page have mostly been vanquished to the realm of legend, but the pirates and the bandits really were a part of local history, and there might actually be buried treasure somewhere here, still waiting to be uncovered. Stranger things have happened. 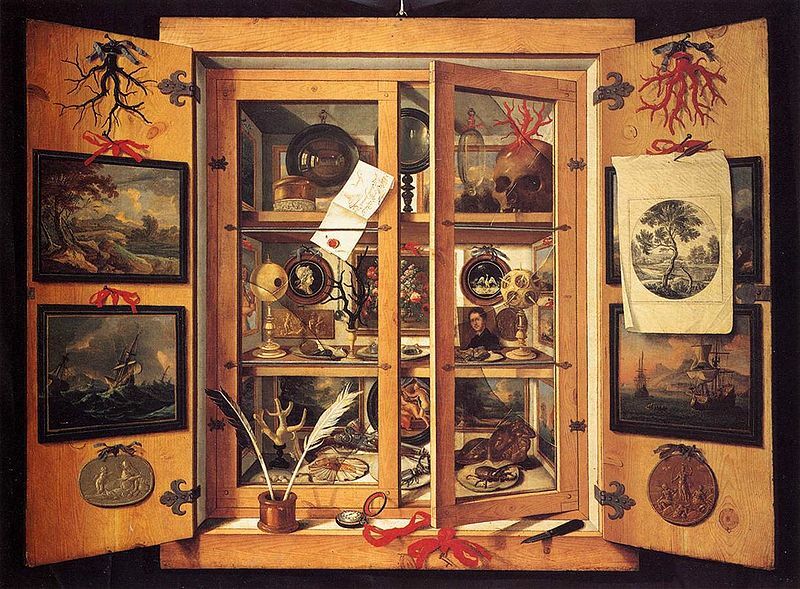 If you, dear reader, know of a Malibu curiosity that ought to be added to our virtual cabinet please send us an email or leave a comment. You never know, there might be giants.